Molson Canadian is doing its part to bring the game of hockey to new heights, literally. Last year, Molson built a professionally made rink in a remote area of the Rocky Mountains in British Columbia, this year, they built a rink, skyhigh, on the rooftop of 120 Adelaide Street West in downtown Toronto. Molson decided to shoot an epic TV spot on this amazing, one-of-a-kind rink, and shooting with a camera-drone, piloted by the DroneBoy team, was the obvious choice. For some of the same reasons that building a rink 32 stories up was difficult, this drone shoot was not without its challenges as well. In Canada, commercial drone flights are limited to 400’ above ground level (AGL), however in this case, the rink level was already very close to that height. Not to be deterred, our logistics team applied for special permission from Transport Canada to get the sign-off needed for additional height, to really get the shots we needed to make this TV spot “fly”. In this case Transport Canada granted us special, one-time only permission to fly to 700’AGL, as the adjacent BMO Tower is actually just under 1000’ AGL, so we could prove that we would not be an obstacle to any potential air traffic. 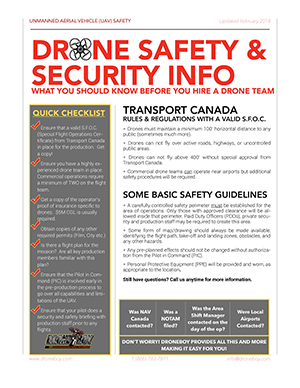 Some other challenges on this shoot were the fact that, as with all commercial drone flights, we needed to create a secure perimeter 100’ in every direction from the drone’s flight path. This meant closing a good portion of both Adelaide and Lombard Streets below, as well as all access points to the building, and a few court yards as well. We brought in an additional security lead who was our “on the ground” point person. He led a team of 8 Pay Duty Police and 10 Production Assistants tasked with the daunting mission of securing the area. Prior to each flight this security team locked down the area, then confirmed this status to our flight team up on the roof. For this shoot we flew the new Arri Mini which was a joy to work with. This camera, coupled with Zeiss CP2 Prime Lenses, created some awesome footage that matched the rest of the Arri cameras on site perfectly. All in all, this was a very complex shoot with a lot of pre-planning and additional resources required, but it was well worth it in the end and we are very proud of the results. We played just a small part in the whole project and everyone did a spectacular job. Somehow we feel a little more Canadian for having been a part of something so epic. Have a look and let us know what you think. This is the stuff hockey dreams are made of.